Rent Sedona Golf Resort | Corporate Events | Wedding Locations, Event Spaces and Party Venues. The Sedona Golf Resort is one of the finest golf courses in Sedona to hold banquets and celebrations. Its sweeping panoramic views and elegant setting provide the perfect backdrop for a memorable business event. Nature's most beautiful achievements add splendor to your special day at the Sedona Golf Resort, one of the most majestic golf courses in Sedona. Here you will find everything you need to plan the perfect Sedona Wedding celebration. Our elegant Juniper Grille dining room seats 150 people and can also accommodate dancing and entertainment. You can choose from a wide selection of reception packages and menus. Perhaps no other golf course on earth provides a better combination of jaw-dropping splendor and exceptional challenge than the acclaimed Sedona Golf Resort. Located in the heart of one of the most captivating regions of the Southwest, the thrilling 6,646-yard, par - 71 golf course is widely considered among the world's most unforgettable golf experiences. None of the other golf courses in Sedona compare. No wonder this championship course receives a continuous four-star rating from Golf Digest. Join us for a round of golf that you will never forget. 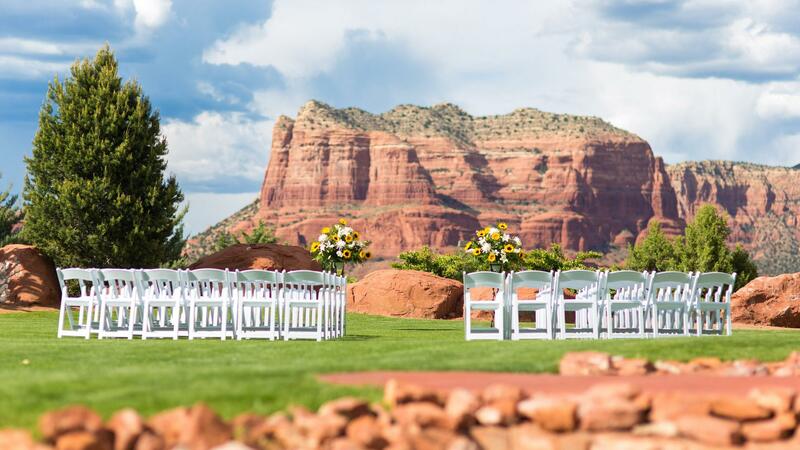 No other Wedding Ceremony Site on the planet has these amazing Sedona views. Courthouse Butte, Lee Mountain and of course the Famous Bell Rock. Add in the meticulously mowed lawn and the serene sound of the nearby creek and you have the perfect location for saying "I do". Our Reception Venue is the only location in Sedona that not only has incredible north-facing views of the Red Rocks and West facing views of the Golf Course but it also sits 150 of your closest family and friends.